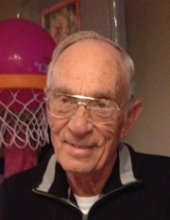 Theodore Roosevelt Leibee 88 of Westwood passed away Sunday, February 10, 2019 at Community Hospice Care Center in Ashland. Ted was born November 15, 1930 in Boyd County to the late William McKinley and Serena Ellen Easterling Leibee. In addition to his parents he was preceded in death by his loving wife of 63 years Virginia Arlene Leibee in 2014; one son Brice M. Leibee; three brothers Robert William Leibee, James H. Leibee and Fred Leibee; four sisters Mildred Lykins, Janice Mansfield, Carolyn Toney Tackett Sexton and Betty Hutchinson. Ted was a faithful member of the Westwood United Baptist Church and he retired from AK Steel after 34 years of service. His favorite past time was spending time with his family and friends. Ted was an avid outdoorsman. He had many memorable times while fishing, hunting and golfing with his family and friends. He leaves behind his son Ted “Jake” Leibee (Heather) of Westwood; two daughters Kathy Saltsman and Debra Crawford (Doug) both of Ashland; three sisters Judy Brown (Fred) of Lexington, Pauline Blevins of Louisa and Linda Davis (Harold) of Brunswick, OH; Grandchildren, Amy R. Mordaunt (Jeff) of Hinckley, OH; Justin M. Leibee of Galveston, TX; Lindsay and Lauren Saltsman, both of Ashland, KY; Tessa Leibee, Brycen Leibee, and Halei M. Leibee, all of Westwood, KY; Ian Crawford (Emilee) and daughter Piper of Louisville, Adam Crawford (Tiffany) of Lexington; great-grandchildren Piper Crawfrod, Travis Jefferson and Andrew Jacob Mordaunt; along with a host of extended family and friends Especially his golfing pals at Sandy Creek Golf Course, and his special friend Charlie Rice. Funeral services will be 11:00 AM Thursday, February 14, 2019 at Caniff Funeral Home in Westwood with Elders from the Westwood United Baptist Church officiating. Burial will follow at Dixon Cemetery. Visitation will be Wednesday from 6-8 and one hour prior to service Thursday at the funeral home. To send flowers or a remembrance gift to the family of Theodore "Ted" Leibee, please visit our Tribute Store. "Email Address" would like to share the life celebration of Theodore "Ted" Leibee. Click on the "link" to go to share a favorite memory or leave a condolence message for the family.